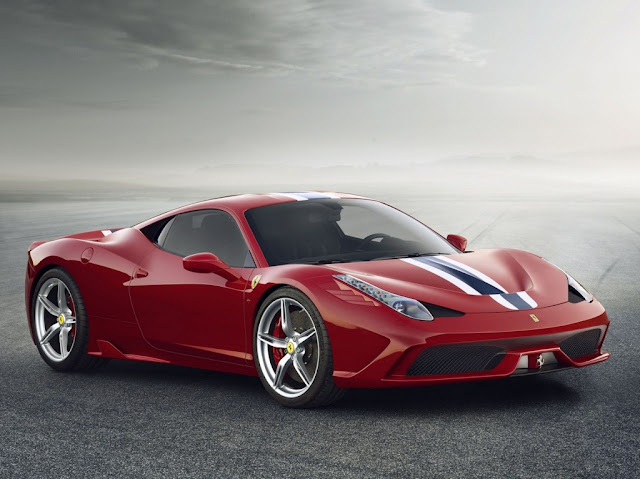 The Ferrari 458 Speciale will be first unveiled at the upcoming Frankfurt Motor show beginning next month. This is not just a makeover of a 458 Italia, this has in fact broken many records and will be the most aerodynamic car in the automobile history. At the heart of this car lies, a 4.5L V8 engine producing 597 horsepower as compared to earlier 562 bhp. The car will not take just 3.0 seconds to reach 0-100 Kmph mark. The Italian carmaker also claims that the car will take just 9.1 seconds to breach 0-200 Kmph mark. Now that's an outstanding figure ! The supercar will be delivering 133 bhp / liter which is the highest by far for any of the naturally aspirated engine. The Ferrari 458 Speciale’s response time (0.060 s) and lateral acceleration (1.33 g) are the highest ever achieved by a Prancing Horse. That of course is not counting Fernando Alonso’s Ferrari. Watch out the Video here.